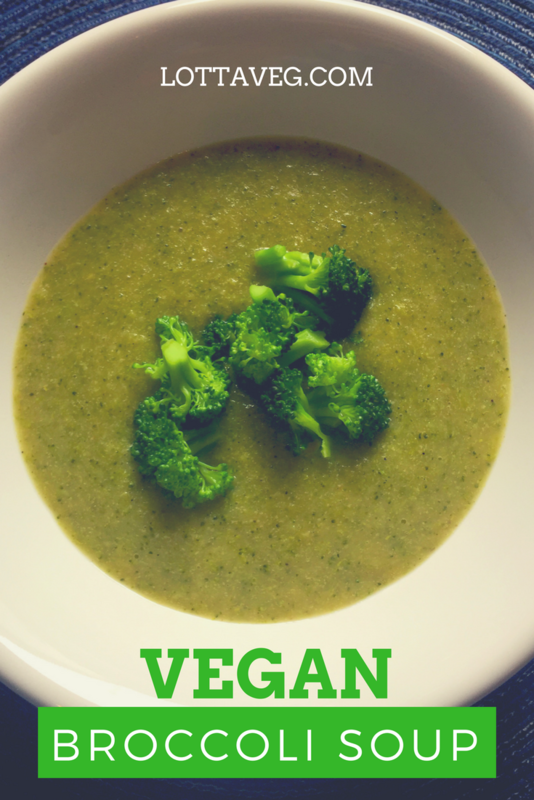 Broccoli is one of our favorite veggies, and we created this Vegan Broccoli Soup so we can eat more of it! At only 75 calories per serving with 5 grams of protein, 3 grams of fiber and 116% of your daily Vitamin C, it’s also a nutritional powerhouse! You can make this recipe with 2 small heads of broccoli or one big head. Since you’re going to blend the ingredients, you can use the broccoli stalks, too. It’s a good use for them so they don’t go to waste. You can also save them for your homemade Easy Vegetable Broth from Scraps. Set aside 2 cups of the broccoli florets for garnish to give your soup a little more visual appeal and texture. We used unsweetened almond milk, but feel free to use your favorite non-dairy milk. This gives the soup a creamier texture. Our recipes are very flavorful…sometimes too flavorful for tender palettes. We used cayenne pepper to spice it up a little, but you can skip that if you want. You can also reduce or eliminate the salt if you’re avoiding it. This Lemony Spring Peas and Zucchini recipe is a fresh and delicious Amelia special. 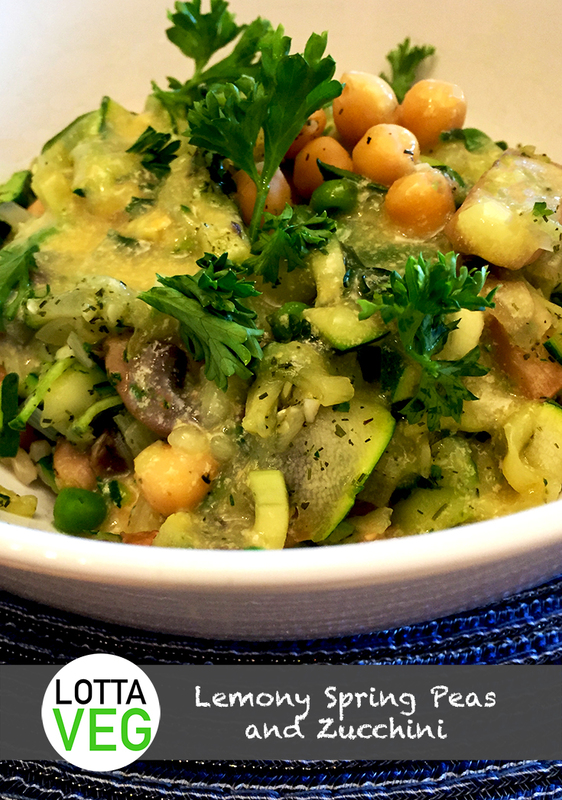 She concocted this recipe from all of our favorite ingredients: zucchini, garbanzo beans, peas, onion and mushrooms. Adding the Lemon Sauce recipe adapted from the Minimalist Baker makes it all lemony and flavorful. We tried to spiralize our zucchini, but the spiralizer we bought doesn’t work very well. It works ok for slicing, but the spiralizing blade did a better job of cutting my thumb than the zucchini. As long as the zucchini is thinly sliced, it works just as well. If you’re using frozen peas, be sure to thaw them first or they won’t cook at the same rate as everything else. You can substitute spaghetti squash or quinoa for the brown rice. You can also serve it without the rice and pair it with some Balsamic Marinated Baked Tofu, Healthy Butternut Squash or BBQ Tempeh. 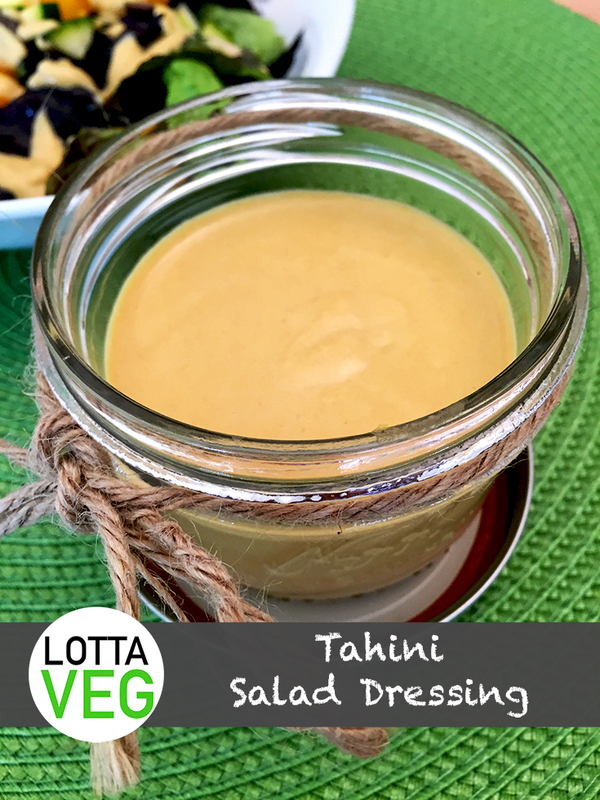 This Tahini Salad Dressing is rich and satisfying. In addition to using it as a salad dressing for your Falafel Salad, you can use it as a condiment on your Veggie Sandwich, Falafel Sandwich or as a dipping sauce for your plain old Vegan Falafel. Tahini has a peanut buttery texture, but it’s made from sesame seeds. It’s a popular condiment in the Eastern Mediterranean and most of Asia. This recipe mixes it with lemon juice and water to thin it out and give it a tanginess. The Nutritional Yeast gives it a little cheese flavor and some B12. It’s pretty high in fat, so if you’re trying to lose weight or lower your cholesterol, you should opt for a lower fat dressing like JP’s Italian Salad Dressing, or try No-Tahini Hummus or Salsa instead. 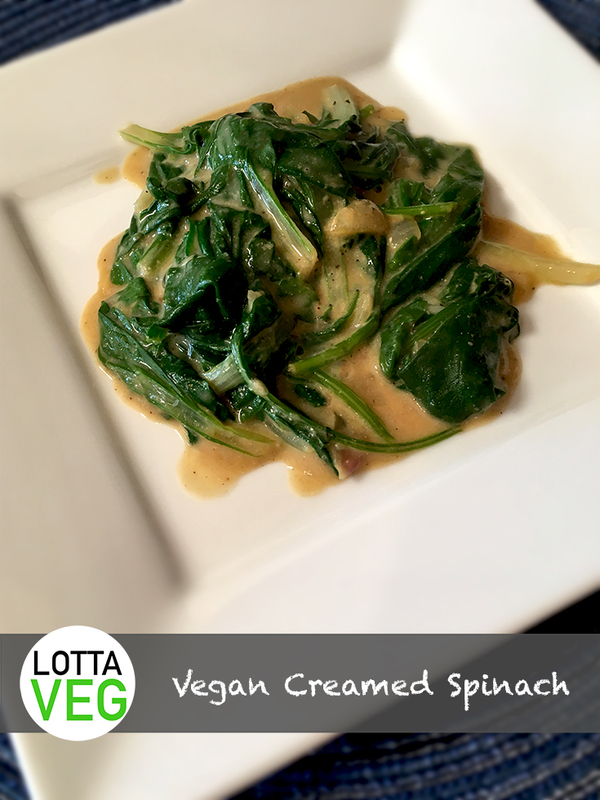 This Vegan Creamed Spinach is easy to prepare and absolutely delicious. A great side-dish on its own or a tasty base for your Vegan Sardou. Spinach is loaded with iron and other healthy nutrients, but it can get tiresome eating it raw all the time. This is a nice alternative that’ll help you add more greens to your daily routine. 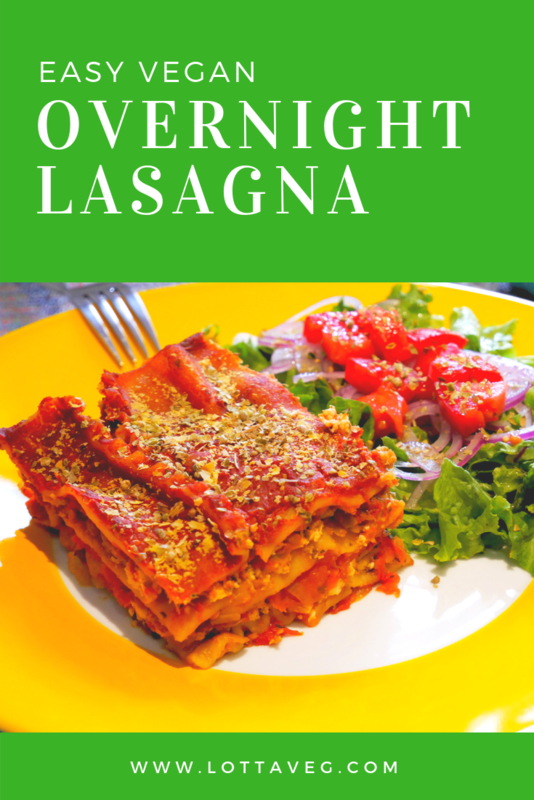 This recipe makes about 2 servings and doesn’t reheat well so you’ll want to finish it in one sitting. If you’re cooking for one, just cut the ingredients in half or double them if you’re cooking for four. 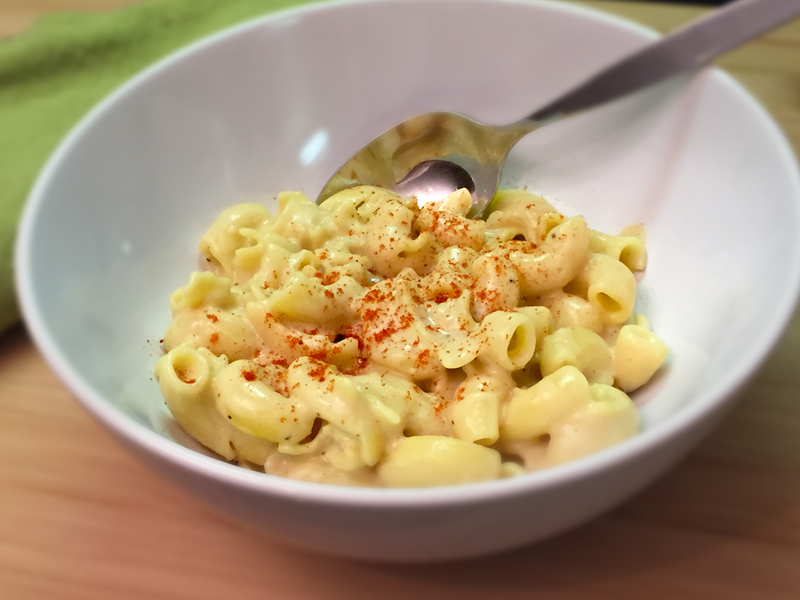 We’ve tried several Vegan Mac and Cheese recipes before finding this one. It’s absolutely delicious, but it doesn’t taste quite like non-vegan mac n cheese. It’s just as creamy and very flavorful, but it lacks the “cheesiness” of regular mac n cheese so adjust your expectations accordingly. If you judge it on its own merits, you may like it better. We used gluten free Ancient Harvest Quinoa Organic Elbow Pasta and cornstarch, which also makes this a Gluten Free Mac and Cheese recipe. We used vegetable broth to sauté the garlic instead of olive oil, so the only oil is 1 tsp drizzled over the roasted garlic. You may be able to use vegetable broth for that, too. That would make this recipe a Vegan Gluten Free, Oil Free & Soy Free Mac and Cheese! It’s delicious! Prepare yourself for yumminess! 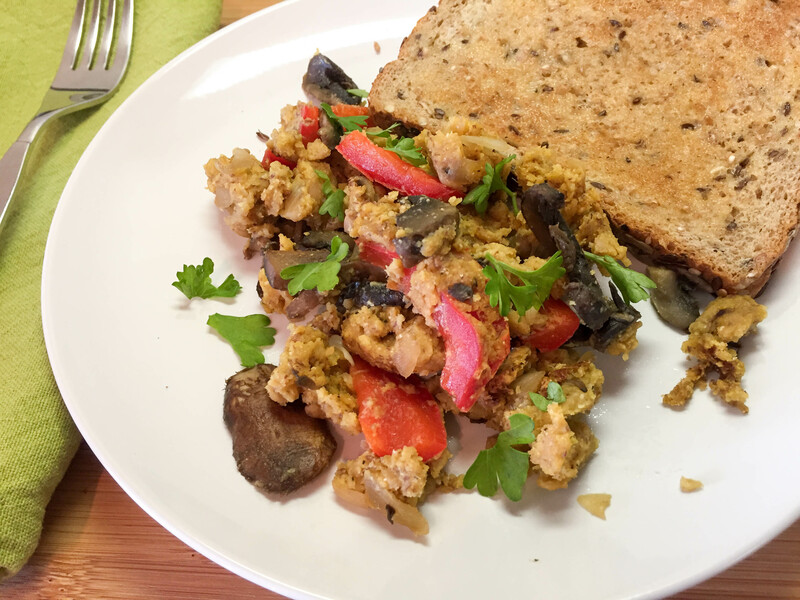 This Chickpea Scramble recipe is a great substitute for eggs and tofu. 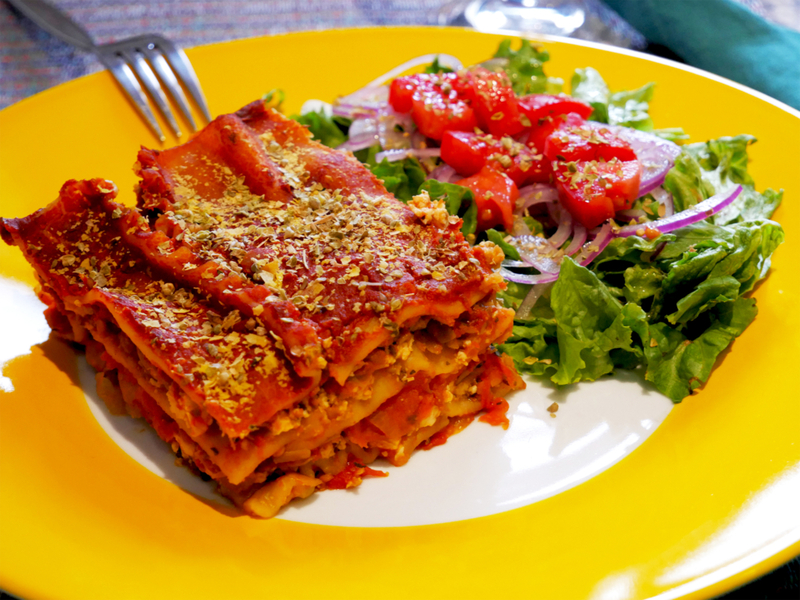 It’s made with chickpea flour, which is full of nutritious protein and complex carbs. It has a similar texture to scrambled eggs while the Himalayan black salt gives the scramble an egg smell and flavor. Like eggs, this recipe has a lot of protein. Unlike eggs, it has a lot of fiber and NO cholesterol. We sautéd the veggies with vegetable broth so it’s also oil free and the chickpea flour makes it gluten free. 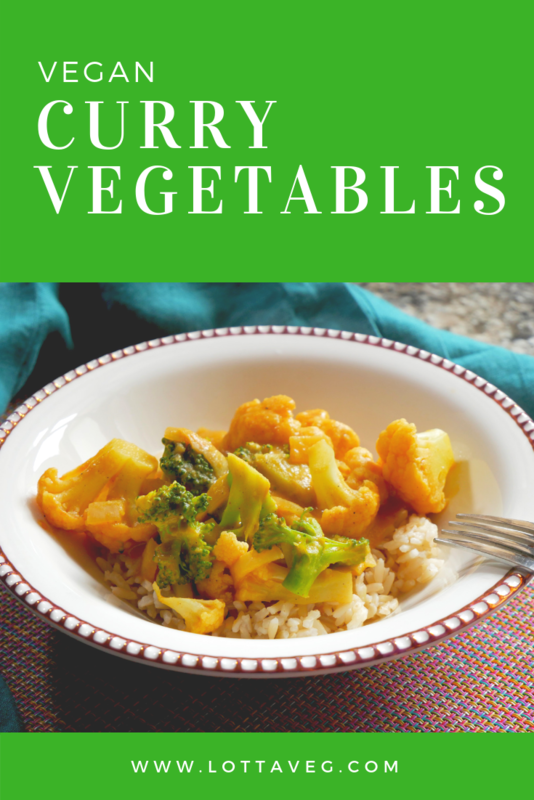 You just can’t go wrong with this delicious recipe! Enjoy with a slice of whole grain toast or our delicious Oven Roasted Red Potatoes. 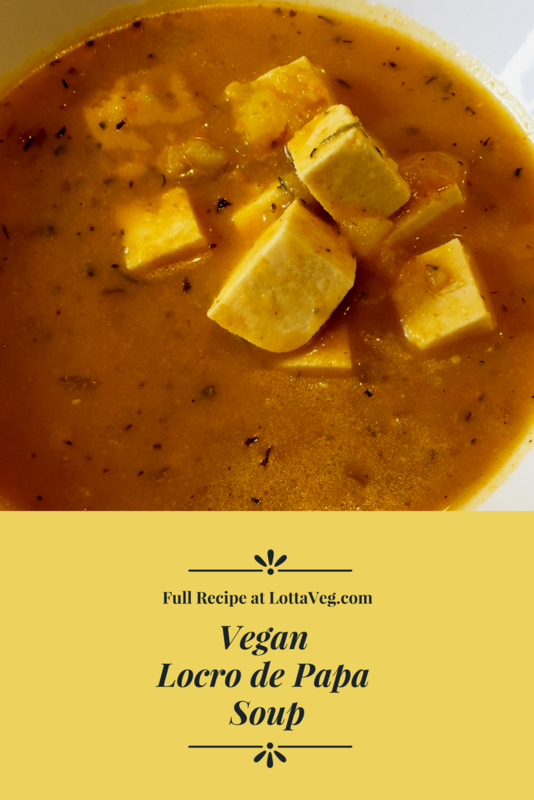 This Vegan Brown Gravy recipe is the perfect addition to your holiday meal. 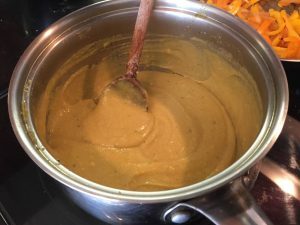 Gravy is a mainstay in the American diet and this recipe will allow you to continue enjoying it, even after you go vegan. We used this gravy with our Vegan Wellington, but it would also go well with just about any dish that calls for brown gravy. You might be tempted to use the brown packet gravy from the store, but this recipe is much healthier and more natural than those. This recipe only takes a few extra minutes, but the taste and nutrition are worth the effort.